EventsHome » Events » Can Mitochondrial Donation Save Lives? Can Mitochondrial Donation Save Lives? « STEAM Club Escape Room! Mitochondria are the powerhouses of the cell and uniquely contain their own genetic material called mitochondrial DNA. Diseases caused by mutations in this mitochondrial DNA are increasingly being recognised and may present with illness at any age. Mitochondrial DNA is passed down only from mother to child and a new IVF technique called Mitochondrial Donation has been developed to prevent this transmission. However Mitochondrial Donation remains controversial and has only been approved for treatment in the UK after the passing of specific Mitochondrial Donation Regulations by the UK Parliament. 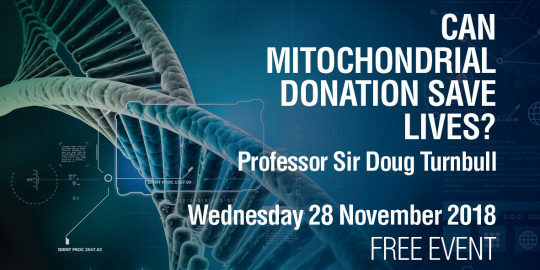 This lecture will focus not only on the importance of Mitochondrial Donation but also on the challenges of changing the law in the UK. The event will include a patient who will describe her experience with mitochondrial DNA disease, which will illustrate the driver for developing mitochondrial donation as an IVF procedure to enable families to have a healthy child. This event is jointly presented by the Convergence Science Network and the Mito Foundation (incorporating the Australian Mitochondrial Disease Foundation) who are hosting Sir Turnbull’s visit to attend the AussieMit 2018 Conference in Melbourne. Professor Sir Doug Turnbull is the Director of the Wellcome Trust Centre for Mitochondrial Disease at Newcastle University. He developed and leads the NHS National Highly Specialised Services for Rare Mitochondrial Diseases of Children and Adults, is Director of the Newcastle University Centre for Brain Ageing and Vitality and is an Honorary Consultant Neurologist at Newcastle upon Tyne Hospitals NHS Foundation Trust. Doug has built one of the best international teams working on diagnosis, treatment and prevention of mitochondrial diseases and worked tirelessly with patients, patient organisations and policy makers to champion Mitochondrial donation. These efforts led to the UK parliament voting to allow this ground-breaking treatment to be offered to patients. He was awarded a Knighthood in the Queen’s Birthday Honours in 2016.